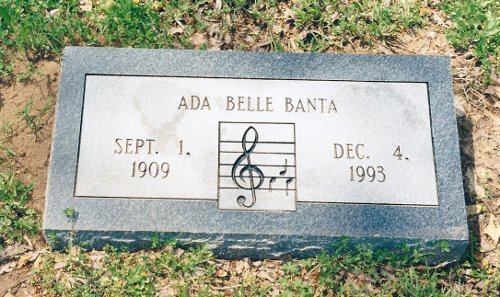 Ada Belle Provence Banta's tombstone, White Rose Cemetery, Wills Point, Tex., courtesy of Charles O. Richardson, Jr.
[S219] Juanita Mayberry, family group record sent to Roger Bartlett, 5 Oct 1975 (naming "Dr. Province" as her father). [S73] Ada Provence Banta, "Anvaline Meredith Provence," in The History of Van Zandt County, Texas (Wills Point, Tex. : Van Zandt County Gen. Soc'y, 1984), p. 298 , (naming Thomas King Provence as her father). [S74] Carmen Majors, "Thomas King Provence, Sr.," in The History of Van Zandt County, Texas (Wills Point, Tex. : Van Zandt County Gen. Soc'y, 1984), pp. 398-99, (naming Thomas King Provence as her father). [S69] Wayne M. Harris, "A. W. Meredith Family," in The History of Van Zandt County, Texas (Wills Point, Tex. : Van Zandt County Gen. Soc'y, 1984), pp. 360-61 (naming Dr. T. K. Provence as her father). [S312] Social Security Death Index, online at http://tinyurl.com/AncestrySSDI, viewed on 24 Feb 1998. [S74] Carmen Majors, "Thomas King Provence, Sr.," above, (spelling his name as Banto). [S312] Social Security Death Index, online at http://tinyurl.com/AncestrySSDI, viewed on 24 Feb 1998 (not naming the place of death but stating that she lived in Canton, Texas when she died). Thomas King ('Tommy') Provence Jr.
[S219] Juanita Mayberry, family group record sent to Roger Bartlett, 5 Oct 1975 (naming "Dr. Province" as his father). [S73] Ada Provence Banta, "Anvaline Meredith Provence," in The History of Van Zandt County, Texas (Wills Point, Tex. : Van Zandt County Gen. Soc'y, 1984), p. 298 , (giving his name as Thomas King Provence II and naming Thomas King Provence as his father). 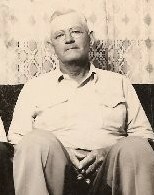 [S74] Carmen Majors, "Thomas King Provence, Sr.," in The History of Van Zandt County, Texas (Wills Point, Tex. : Van Zandt County Gen. Soc'y, 1984), pp. 398-99, (giving his name as Thomas King ("Tommy") Provence Jr. and naming Thomas King Provence as his father). [S69] Wayne M. Harris, "A. W. Meredith Family," in The History of Van Zandt County, Texas (Wills Point, Tex. : Van Zandt County Gen. Soc'y, 1984), pp. 360-61 (naming Dr. T. K. Provence as his father). [S137] Index to Texas Delayed Probate Birth Records (Austin, Tex. : Tex. Dept. of Health, Bur. of Vital Statistics), vol. 29, p. 14194, file 324653. [S312] Social Security Death Index, online at http://tinyurl.com/AncestrySSDI, viewed on 1 Apr 1998 (giving his name as Tommy Provence and giving only the date). [S11] Index to Texas Death Records (Austin, Tex. : Tex. Dept. of Health, Bur. of Vital Statistics), typescript, 1988 (microfiche), p. 1637, file 10981-88. [S69] Wayne M. Harris, "A. W. Meredith Family," in The History of Van Zandt County, Texas (Wills Point, Tex. : Van Zandt County Gen. Soc'y, 1984), pp. 360-61 (giving her name as Dr. Sally A. Provence and naming Dr. T. K. Provence as her father). [S137] Index to Texas Delayed Probate Birth Records (Austin, Tex. : Tex. Dept. of Health, Bur. of Vital Statistics), vol. 29, p. 14194, file 336239. [S312] Social Security Death Index, online at http://tinyurl.com/AncestrySSDI, viewed on 1 Apr 1998 (giving her name as Sally Provence and giving only the date). [S312] Social Security Death Index, online at http://tinyurl.com/AncestrySSDI, viewed on 1 Apr 1998 (giving her name as Sally Provence; not naming the place of death but stating that she lived in Branford, Connecticut when she died). [S236] Photograph of grave marker provided by Charles O. Richardson, Jr. on 14 Apr 1997, above (giving her name as Sally Anvaline Provence M.D.). [S219] Juanita Mayberry, family group record sent to Roger Bartlett, 5 Oct 1975 (naming Jim (James) Harris as Jane Harris's father). [S72] Wayne M. Harris, "James A. Harris Family," in The History of Van Zandt County, Texas (Wills Point, Tex. : Van Zandt County Gen. Soc'y, 1984), pp. 278-79, (naming James H. Harris as her father). [S69] Wayne M. Harris, "A. W. Meredith Family," in The History of Van Zandt County, Texas (Wills Point, Tex. : Van Zandt County Gen. Soc'y, 1984), pp. 360-61 (naming Jim H. Harris as her father). [S219] Juanita Mayberry, family group record, 5 Oct 1975, above (naming Corinne Meredith as Jane Harris's mother). [S72] Wayne M. Harris, "James A. Harris Family," above, (naming Corrinne [sic] Harris as her mother). [S69] Wayne M. Harris, "A. W. Meredith Family," above (naming Corrinne [sic] Meredith as her mother). [S58] Index to Texas Birth Records (Austin, Tex. : Tex. Dept. of Health, Bur. of Vital Statistics), typescript 1911, vol. 1, p. 470, file 22404 (not giving her name but identifying her as "Inf. of J. H. Harris"). [S219] Juanita Mayberry, family group record, 5 Oct 1975, above (giving her name as Jane Harris and giving only the date). [S312] Social Security Death Index, online at http://tinyurl.com/AncestrySSDI, viewed on 13 Mar 1998 (giving her name as Jane Randolph and not naming the place of death). [S312] Social Security Death Index, online at http://tinyurl.com/AncestrySSDI, viewed on 13 Mar 1998 (giving her name as Jane Randolph; stating that she died in Sep 1987; not naming the place of death but stating that she lived in Canton, Texas when she died). [S236] Photograph of grave marker provided by Charles O. Richardson, Jr. on 14 Apr 1997, above (giving her name as Jane Harris Randolph). [S219] Juanita Mayberry, family group record sent to Roger Bartlett, 5 Oct 1975 (naming Jim (James) Harris as his father). [S72] Wayne M. Harris, "James A. Harris Family," in The History of Van Zandt County, Texas (Wills Point, Tex. : Van Zandt County Gen. Soc'y, 1984), pp. 278-79, (naming James H. Harris as his father). [S69] Wayne M. Harris, "A. W. Meredith Family," in The History of Van Zandt County, Texas (Wills Point, Tex. : Van Zandt County Gen. Soc'y, 1984), pp. 360-61 (naming Jim H. Harris as his father). [S219] Juanita Mayberry, family group record, 5 Oct 1975, above (naming Corinne Meredith as his mother). [S72] Wayne M. Harris, "James A. Harris Family," above, (naming Corrinne [sic] Harris as his mother). [S69] Wayne M. Harris, "A. W. Meredith Family," above (naming Corrinne [sic] Meredith as his mother). [S137] Index to Texas Delayed Probate Birth Records (Austin, Tex. : Tex. Dept. of Health, Bur. of Vital Statistics), sec. 2, vol. 5, p. 2493, file 1307525. [S312] Social Security Death Index, online at http://tinyurl.com/AncestrySSDI, viewed on 13 Mar 1998 (giving his name as Jim Harris and giving only the date). [S312] Social Security Death Index, online at http://tinyurl.com/AncestrySSDI, viewed on 13 Mar 1998 (giving his name as Jim Harris; not naming the place of death but stating that he lived in Krum, Texas when he died). [S1559] Texas Death Index, 1964-1998, online at https://www.familysearch.org, record for James Harbert Harris, Jr., viewed on 28 Jan 2019. Waynie Meredith Greer White, from a newspaper obituary. [S219] Juanita Mayberry, family group record sent to Roger Bartlett, 5 Oct 1975 (naming Carl M. Greer as her father). [S69] Wayne M. Harris, "A. W. Meredith Family," in The History of Van Zandt County, Texas (Wills Point, Tex. : Van Zandt County Gen. Soc'y, 1984), pp. 360-61 (naming Earl M. Greer as her father). [S219] Juanita Mayberry, family group record, 5 Oct 1975, above (naming Waynie Belle Meredith as her mother). [S69] Wayne M. Harris, "A. W. Meredith Family," above (naming Waynie Meredith as her mother). [S124] Austin American-Statesman, Austin, Tex., 9 Sep 2012, p. B4, col. 3 (obituary of Waynie Meredith Greer White). [S69] Wayne M. Harris, "A. W. Meredith Family," above (giving his name as Arnold White and not giving the date or place). Other Names*: Belle Mosely, Belle Bartlett. [S9] Grave marker, Rice Cemetery, Rice, Tex. (giving only the date). [S374] Bob Martin, electronic mail to Roger Bartlett, 16 Feb 1998, (spelling her surname as Mosley). [S43] Marriage Records, Navarro County, Tex., vol. 7, p. 292 (giving her name as Bell M. Mosely). [S491] Marriage license for J. L. Bartlett and Bell M. Moseley, recorded in bk. 7, p. 292, Marriage Records, Navarro County, Tex. (original in possession of Roger Bartlett),(spelling her first name as Bell). [S440] Navarro County Cemetery Records, vol. 4 (Corsicana, Tex. : The Navarro County Gen. Soc'y, 1985), p. 88 (spelling her name as Bell). Alan Howard Snyder Jr.'s tombstone, Sparkman Hillcrest Memorial Park, Dallas, Tex., courtesy of Becky Romo. [S961] Find A Grave, online at http://www.findagrave.com, memorial for Alan H. Snyder, Jr., memorial no. 7227319, viewed on 4 Oct 2011. 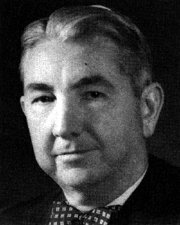 Justice William Franklin Ramsey, courtesy of Weldon Collins. Note*: He sat on both the Texas Supreme Court and the Texas Court of Criminal Appeals. At the time of his death he was chairman of the Federal Reserve Bank of Dallas. • His biography from the University of Texas School of Law Tarlton Law Library Jamail Center for Legal Research is here. [S961] Find A Grave, online at http://www.findagrave.com, memorial for William Franklin Ramsey, memorial no. 102637962, viewed on 10 Aug 2017. [S1177] Ancestry of Ramsey Clark, online, above, viewed on 8 Mar 2008 (naming William Franklin Ramsey as her father). Other Names*: Mary Jane Ramsey Clark, Mary Jane Clark, Mary Jane Ramsey, Mary Ramsey Clark, Mary Ramsey. • Her Find A Grave memorial, which includes an obituary and a picture of her tombstone, is here. [S1177] Ancestry of Ramsey Clark, online http://www.wargs.com/political/clarkr.html, viewed on 8 Mar 2008 (naming William Franklin Ramsey as her father). [S961] Find A Grave, online at http://www.findagrave.com, memorial for Mary Ramsey Clark, memorial no. 6988150, viewed on 30 Dec 2016. [S1177] Ancestry of Ramsey Clark, online, above, viewed on 8 Mar 2008. Justice Tom Clark, from Wikipedia. Other Names*: Tom Clark, Tom C. Clark, Thomas C. Clark. • The Wikipedia entry on Justice Clark is here. [S1099] Wikipedia Online Encyclopedia http://en.wikipedia.org/wiki/Main_Page, s.v. "Tom C. Clark," viewed on 7 Mar 2008. [S1169] The New York Times, New York, N.Y., 14 Jun 1977 (obituary of Tom C. Clark), p. 38. [S67] The Dallas Morning News, Dallas, Tex., 14 Jun 1977, sec. D, p. 5 (obituary of Tom Clark). [S1169] The New York Times, New York, N.Y., 14 Jun 1977 (obituary of Tom C. Clark), p. 1. [S1099] Wikipedia Online Encyclopedia, above, s.v. "Tom C. Clark," viewed on 7 Mar 2008 (naming the cemetery but not giving the date). [S67] The Dallas Morning News, Dallas, Tex., 16 Jun 1977, sec. B, p. 17 (funeral announcement for Tom Clark). [S1144] Gin A. Crimm-Denison, electronic mail to Roger Bartlett, 8 Jul 2007, (naming William Estes Bartlett as his father). [S1144] Gin A. Crimm-Denison, electronic mail to Roger Bartlett, 8 Jul 2007, (naming Carrie Adella Kirkpatrick as his mother). [S1144] Gin A. Crimm-Denison, electronic mail to Roger Bartlett, 8 Jul 2007, (naming William Estes Bartlett as her father). [S1144] Gin A. Crimm-Denison, electronic mail to Roger Bartlett, 8 Jul 2007, (naming Carrie Adella Kirkpatrick as her mother). 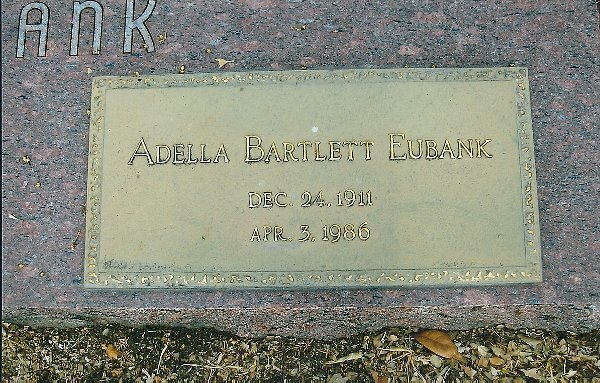 Adella Bartlett Eubank's tombstone, Evergreen Cemetery, Ballinger, Tex., courtesy of Diane Ellington. [S121] Grave marker, Adella Bartlett Eubank, Evergreen Cemetery, Ballinger, Texas. 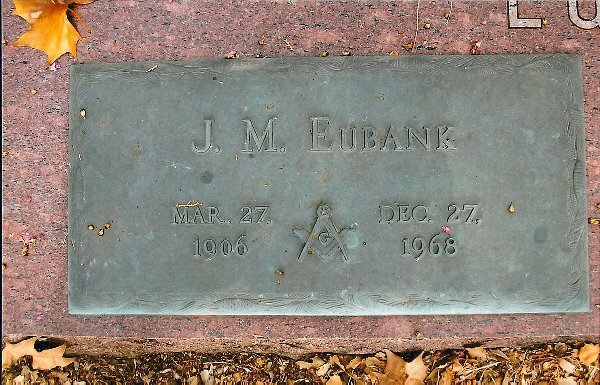 J. M. Eubank's tombstone, Evergreen Cemetery, Ballinger, Tex., courtesy of Diane Ellington. [S121] Grave marker, J. M. Eubank, Evergreen Cemetery, Ballinger, Texas. [S1144] Gin A. Crimm-Denison, electronic mail to Roger Bartlett, 8 Jul 2007. Roy Bartlett McCorkle, courtesy of Audrey Vodehnal. • His memorial at Find A Grave is here. [S406] Mary Jo Deaver, "McCorkle Families," in A History of Coleman County and Its People, vol. 2 (Coleman, Tex. : The Coleman County Hist. Commission, 1985), pp. 893-95, (naming Rev. 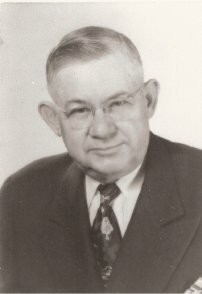 John James Ray McCorkle as his father). [S961] Find A Grave, online at http://www.findagrave.com, memorial for Ray Bartlett McCorkle, memorial no. 38167827, viewed on 24 Sep 2011 (naming John Ray McCorkle as his father). [S961] Find A Grave, online, above, memorial for Rev. John Ray McCorkle, memorial no. 33547333, viewed on 28 Sep 2011 (naming Rev. John Ray McCorkle as his father). [S406] Mary Jo Deaver, "McCorkle Families," above, (naming Emma Lena Bartlett as his mother). [S961] Find A Grave, online, above, memorial for Ray Bartlett McCorkle, memorial no. 38167827, viewed on 24 Sep 2011 (naming Emma Bartlett McCorkle as his mother). [S406] Mary Jo Deaver, "McCorkle Families," above, (naming the county but not the town). [S406] Mary Jo Deaver, "McCorkle Families," above, (giving her name as Rose Fredrick). [S961] Find A Grave, online, above, memorial for Rosalie Williams McCorkle, memorial no. 38204163, viewed on 24 Sep 2011. [S406] Mary Jo Deaver, "McCorkle Families," above. [S961] Find A Grave, online, above, memorial for John Ray McCorkle, memorial no. 55553146, viewed on 24 Sep 2011 (naming Ray Bartlett McCorkle as his father). [S961] Find A Grave, online, above, memorial for Betty Jo Mcorkle [sic] Lee, memorial no. 38161101, viewed on 24 Sep 2011 (naming Ray Bartlett McCorkle as her father). Marriage*: She married Larue Cox on 30 August 1922. [S160] Mary Jo Deaver, 1218 Northwood Lake, Northport, Ala. 35476, family pedigree chart, 10 Nov 1979, in Navarro County Genealogical Society Family Pedigree Charts (Corsicana, Tex. : The Navarro County Gen. Soc'y, 1980), chart no. 4, (giving her name as Lena). [S312] Social Security Death Index, online at http://tinyurl.com/AncestrySSDI, viewed on 20 Mar 1998 (not naming the place of death but stating that she lived in Lindale, Texas when she died). [S1283] Ben Cox, electronic mail to Roger Bartlett, 14 Oct 2013 (naming Emma Lena McCorkle as his mother). 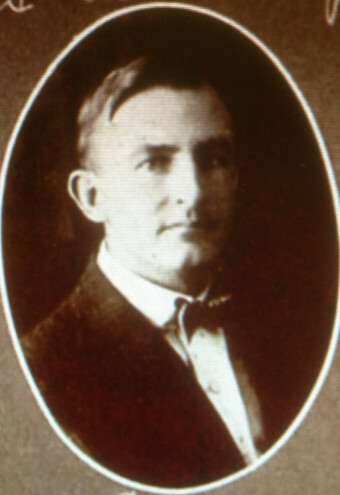 Larue Cox, from The Lasso, Howard Payne College yearbook, 1920. Marriage*: He married Emma Lena McCorkle, daughter of Rev. John James Ray McCorkle and Emma Lena Bartlett, on 30 August 1922. [S1283] Ben Cox, electronic mail to Roger Bartlett, 14 Oct 2013 (giving the year but no other information). [S312] Social Security Death Index, online at http://tinyurl.com/AncestrySSDI, record for Larue Cox, viewed on 15 Oct 2013. [S1283] Ben Cox, electronic mail to Roger Bartlett, 14 Oct 2013. [S1283] Ben Cox, electronic mail to Roger Bartlett, 14 Oct 2013 (naming Larue Cox as his father). Piercy Lee McCorkle Lamb's tombstone, Santa Anna Cemetery, Santa Anna, Tex., courtesy of Steve Voss. Other Names*: Piercy McCorkle, Piercy Lee McCorkle Lamb, Piercy Lee Lamb, Piercy Lamb McCorkle, Piercy Lamb. [S961] Find A Grave, online at http://www.findagrave.com, memorial for Rev. John Ray McCorkle, memorial no. 33547333, viewed on 28 Sep 2011 (naming Rev. John Ray McCorkle as her father). [S137] Index to Texas Delayed Probate Birth Records (Austin, Tex. : Tex. Dept. of Health, Bur. of Vital Statistics), sec. 2, vol. 8, p. 3646, file 1047398. [S497] Vena Bob Gates, Julie Terry, & Ralph Terry, comps., Coleman County Cemetery Inscriptions, vol. 3 (Coleman, Tex. : Terry Studio, 1988), p. 154 (giving the date but not naming the place) (common marker with Melvin Warren Lamb). [S961] Find A Grave, online, above, memorial for Piercy Lee McCorkle Lamb, memorial no. 39450659, viewed on 24 Sep 2011. [S1092] Abilene Reporter-News, Abilene, Tex., 7 Mar 1966, p. 3, col. 4 (obituary for Mrs. Melvin Lamb). [S497] Vena Bob Gates, Julie Terry, & Ralph Terry, comps., Coleman County Cemetery Inscriptions, vol. 3, above, p. 154 (common marker for Melvin Warren Lamb and Piercy Lee Lamb) (giving the date but not the place). [S961] Find A Grave, online, above, memorial for Piercy Lee McCorkle Lamb, memorial no. 39450659, viewed on 24 Sep 2011 (giving the date but not the place). [S961] Find A Grave, online, above, memorial for Melvin Warren Lamb, memorial no. 39450343, viewed on 25 Sep 2011 (giving the date but not the place). [S11] Index to Texas Death Records (Austin, Tex. : Tex. Dept. of Health, Bur. of Vital Statistics), typescript, 1966, vol. 2, p. 805, file 14707. [S1092] Abilene Reporter-News, Abilene, Tex., 7 Mar 1966, p. 3, col. 4 (obituary for Mrs. Melvin Lamb) (stating that she "had been ill for some time" and died at 2:30 p.m.). [S497] Vena Bob Gates, Julie Terry, & Ralph Terry, comps., Coleman County Cemetery Inscriptions, vol. 3, above, p. 154 (common marker with Melvin Warren Lamb). [S961] Find A Grave, online, above, memorial for Mary Ruth Lamb Irick, memorial no. 162556727, viewed on 20 Jun 2018 (naming Lee McCorkle Lamb as her mother). Melvin Warren Lamb's tombstone, Santa Anna Cemetery, Santa Anna, Tex., courtesy of Steve Voss. [S497] Vena Bob Gates, Julie Terry, & Ralph Terry, comps., Coleman County Cemetery Inscriptions, vol. 3 (Coleman, Tex. : Terry Studio, 1988), p. 154 (common marker with Piercy Lee Lamb). [S961] Find A Grave, online at http://www.findagrave.com, memorial for Melvin Warren Lamb, memorial no. 39450343, viewed on 25 Sep 2011. [S312] Social Security Death Index, online at http://tinyurl.com/AncestrySSDI, viewed on 27 Jul 2004 (stating that he died on 8 Nov 1993; not naming the place of death but stating that he lived in Brownwood, Tex. when he died). [S497] Vena Bob Gates, Julie Terry, & Ralph Terry, comps., Coleman County Cemetery Inscriptions, vol. 3, above, p. 154 (supposing that he is buried there because his name appears on a grave marker although the marker does not bear a date of death) (common marker with Piercy Lee McCorkle Lamb). [S961] Find A Grave, online, above, memorial for John Bartlett Lamb, memorial no. 39450796, viewed on 25 Sep 2011 (naming Melvin Warren Lamb as his father). [S961] Find A Grave, online, above, memorial for Mary Ruth Lamb Irick, memorial no. 162556727, viewed on 20 Jun 2018 (naming Melvin Lamb as her father). Mary C. McCorkle's tombstone, Santa Anna Cemetery, Santa Anna, Tex., courtesy of Diane Ellington. "Mary C. McCorkle, 78, of Santa Anna died in Brownwood Community Hospital at 5:55 a.m. Friday, February 15, 1980, after a short illness. Funeral services were held in First Baptist Church in Santa Anna Sunday at 2:30 p.m. and interment was in Santa Anna Cemetery under direction of Henderson Funeral Home of Santa Anna. "Rev. John Stanislaw, pastor of the church, officiated; Rev. Charles Sheffield, pastor of Concho Baptist Church of Coleman, assisted; and nephews services as pallbearers. "Miss McCorkle, who was born in Navarro County April 7, 1901, was a lifelong resident of Santa Anna, a graduate of Santa Anna schools and Howard Payne University. A member of Santa Anna Chapter No. 247 of the Order of Eastern Star, and a member of the Baptist Church, she taught at Buckner Orphans Home in Dallas for 20 years. Note*: • She never married. • Her (delayed) birth certificate says she was born in Coleman County, Texas, while an obituary says she was born in Navarro County. • Her Find A Grave memorial, which includes her picture, is here. [S137] Index to Texas Delayed Probate Birth Records (Austin, Tex. : Tex. Dept. of Health, Bur. of Vital Statistics), sec. 2, vol. 8, p. 3646, file 1047893. [S497] Vena Bob Gates, Julie Terry, & Ralph Terry, comps., Coleman County Cemetery Inscriptions, vol. 3 (Coleman, Tex. : Terry Studio, 1988), p. 85 (giving the date but not naming the place). [S121] Grave marker, Mary C. McCorkle, Santa Anna Cemetery, Santa Anna, Texas (giving the date but no other details). 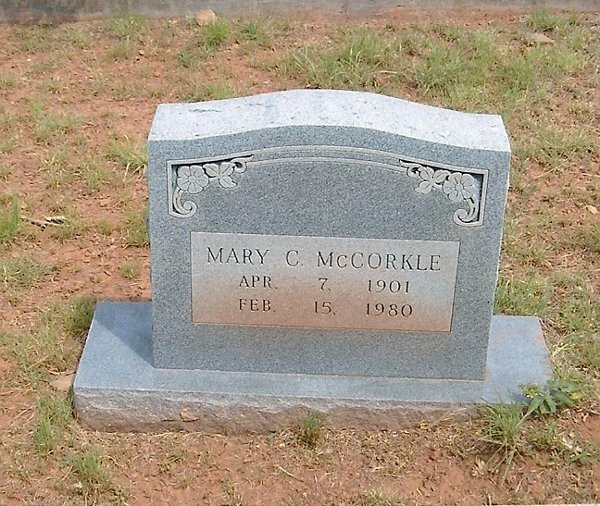 [S961] Find A Grave, online at http://www.findagrave.com, memorial for Mary C. McCorkle, memorial no. 25181538, viewed on 26 Aug 2018 (giving the date but not the place). [S11] Index to Texas Death Records (Austin, Tex. : Tex. Dept. of Health, Bur. of Vital Statistics), typescript, 1964-1988 (microfiche), p. 27425, file 5362-80 (giving the date and county but no other information). [S312] Social Security Death Index, online at http://tinyurl.com/AncestrySSDI, viewed on 20 Mar 1998 (stating that she died in Feb 1980; not naming the place of death but stating that she lived in Brownwood, Texas when she died and that last benefits were sent to an address in Santa Anna, Texas). [S497] Vena Bob Gates, Julie Terry, & Ralph Terry, comps., Coleman County Cemetery Inscriptions, vol. 3, above, p. 85 (giving the date but not the place). [S522] The Coleman Democrat-Voice, Coleman, Tex., online at https://texashistory.unt.edu, 19 Feb 1990, p. 4-A, col. 5 (obituary for Mary C. McCorkle) (stating that she died at 5:55 in the morning after a short illness). [S497] Vena Bob Gates, Julie Terry, & Ralph Terry, comps., Coleman County Cemetery Inscriptions, vol. 3, above, p. 85. [S121] Grave marker, Mary C. McCorkle, Santa Anna Cemetery, Santa Anna, Texas. [S522] The Coleman Democrat-Voice, Coleman, Tex., above, 19 Feb 1990, p. 4-A, col. 5 (obituary for Mary C. McCorkle) (stating that interment was under the direction of Henderson Funeral Home, Santa Anna, Tex.). [S961] Find A Grave, online, above, memorial for Mary C. McCorkle, memorial no. 25181538, viewed on 26 Aug 2018 (not giving the date). [S522] The Coleman Democrat-Voice, Coleman, Tex., above, 19 Feb 1990, p. 4-A, col. 5 (reprinted here with consent of The Coleman Democrat-Voice). [S160] Mary Jo Deaver, family pedigree chart, 10 Nov 1979, above, (first bullet). [S137] Index to Texas Delayed Probate Birth Records, above, sec. 2, vol. 8, p. 3646, file 1047893 (second bullet) (giving Coleman County, Texas as her birth place). [S522] The Coleman Democrat-Voice, Coleman, Tex., above, 19 Feb 1990, p. 4-A, col. 5 (obituary for Mary C. McCorkle) (second bullet) (giving Navarro County, Texas as her birth place). [S522] The Coleman Democrat-Voice, Coleman, Tex., above, 19 Feb 1990, p. 4-A, col. 5 (obituary for Mary C. McCorkle) (third bullet). [S711] Sherrie McCorkle, electronic mail to Roger Bartlett, 19 Nov 2001, (naming Rev. 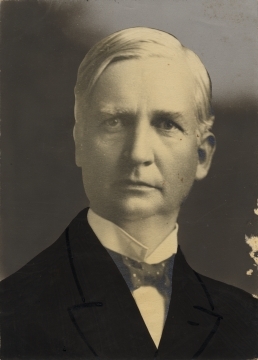 Archibald McCorkle, Jr. as his father). [S711] Sherrie McCorkle, electronic mail to Roger Bartlett, 19 Nov 2001, (naming Elizabeth L. Wear as his mother). Marriage*: She married Rev. John James Ray McCorkle, son of John James Rea McCorkle and Izetta Emma Long, in 1905. Note*: Della was a widow with three children when she and John married. They had no children. [S498] Vena Bob Gates, Julie Terry, & Ralph Terry, comps., Coleman County Cemetery Inscriptions, vol. 1 (Coleman, Tex. : Terry Studio, 1988), p. 185. [S498] Vena Bob Gates, Julie Terry, & Ralph Terry, comps., Coleman County Cemetery Inscriptions, vol. 1, above, p. 185 (giving only the year and not naming the place). [S11] Index to Texas Death Records (Austin, Tex. : Tex. Dept. of Health, Bur. of Vital Statistics), typescript, 1903-40, vol. 32, p. 15616, file 7235. Robert Edmund McCorkle, courtesy of Audrey Vodehnal. Note*: His middle name may have been Edmund. • His memorial on Find A Grave, which includes a copy of his death certificate, is here. [S334] Mrs. Daniel J. Tindol, 2200 Vine, Brownwood, Tex. 76801, letter to Roger Bartlett, postmarked 2 Mar 1976, (naming John Rea McCorkle as his father). [S961] Find A Grave, online at http://www.findagrave.com, memorial for Robert Edmund ('Edd') McCorkle, memorial no. 33545863, viewed on 24 Sep 2011 (naming John Ray McCorkle as his father). [S334] Mrs. Daniel J. Tindol 2 Mar 1976 letter, above, (naming Emma Lena Bartlett as his mother). [S961] Find A Grave, online, above, memorial for Robert Edmund ('Edd') McCorkle, memorial no. 33545863, viewed on 24 Sep 2011 (naming Emma Lena Bartlett as his mother). [S498] Vena Bob Gates, Julie Terry, & Ralph Terry, comps., Coleman County Cemetery Inscriptions, vol. 1 (Coleman, Tex. : Terry Studio, 1988), p. 211 (giving the date but not the place) (common marker with Oma P. McCorkle). [S961] Find A Grave, online, above, memorial for Robert Edmund ('Edd') McCorkle, memorial no. 33545863, viewed on 24 Sep 2011. [S334] Mrs. Daniel J. Tindol 2 Mar 1976 letter, above, (giving the date but not the place). [S11] Index to Texas Death Records (Austin, Tex. : Tex. Dept. of Health, Bur. of Vital Statistics), typescript, 1962, vol. 2, p. 812, file 15861 (spelling his middle name as Edmund) (giving the date and county). [S160] Mary Jo Deaver, family pedigree chart, 10 Nov 1979, above, (giving the date and county). [S406] Mary Jo Deaver, "McCorkle Families," in A History of Coleman County and Its People, vol. 2 (Coleman, Tex. : The Coleman County Hist. Commission, 1985), pp. 893-95, (spelling his middle name as Edmund) (giving the date and county). [S498] Vena Bob Gates, Julie Terry, & Ralph Terry, comps., Coleman County Cemetery Inscriptions, vol. 1, above, p. 211 (common marker with Oma P. McCorkle) (naming the cemetery but not giving the date). [S334] Mrs. Daniel J. Tindol 2 Mar 1976 letter, above, (naming Robert Edmund McCorkle as her father). [S334] Mrs. Daniel J. Tindol 2 Mar 1976 letter, above, (naming Robert E. McCorkle as her father). Marriage*: He married Billie Ruth Jamison in July 1954. Note*: He was city manager of Coleman, Texas. [S498] Vena Bob Gates, Julie Terry, & Ralph Terry, comps., Coleman County Cemetery Inscriptions, vol. 1 (Coleman, Tex. : Terry Studio, 1988), p. 211 (supposing that he is buried there because his name appears on a grave marker although the marker does not bear a date of death) (common marker with Roy E. McCorkle). [S58] Index to Texas Birth Records (Austin, Tex. : Tex. Dept. of Health, Bur. of Vital Statistics), typescript 1929, vol. 3, p. 1182, file 1723 (not giving his name but identifying him as "Inf. of Ed McCorkle"). [S498] Vena Bob Gates, Julie Terry, & Ralph Terry, comps., Coleman County Cemetery Inscriptions, vol. 1, above, p. 211 (giving only the date) (common marker with Billie R. Jamison McCorkle).